Frost seeding is a popular option to improve forage yield and quality of pasture and hay land. The principle of frost seeding is to broadcast forage seed in the early spring when the ground freezes at night and thaws during the day. The main advantage to frost seeding is the ability to establish desirable species into an undisturbed sod at a low per acre cost. A 60% to 70% frost seeding establishment rate has been reported by many farmers (Undersander, 2006). The success of frost seeding establishment can be increased by following the key steps outlined below. The optimum practice is to seed early in the spring after the snow is gone but while the ground is still frozen. The repeated freezing and thawing will cause some of the seed to fall into soil cracks and germinate. 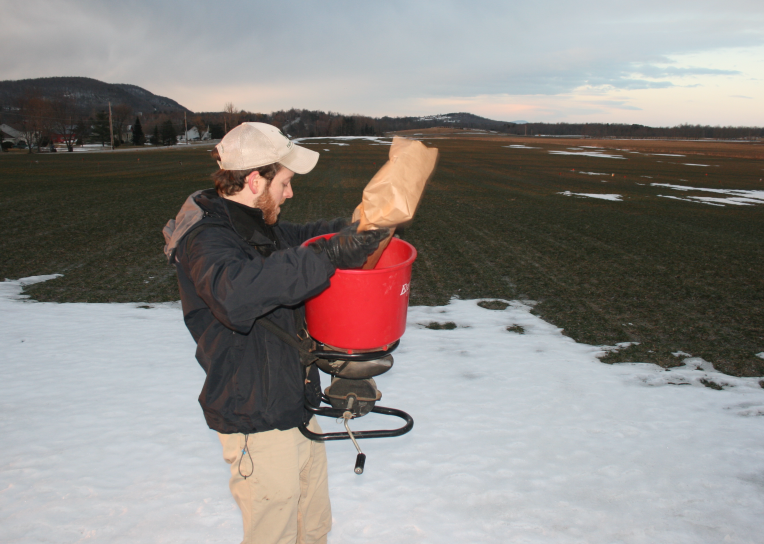 Frost seeding can be done over a thin layer of snow. However, be aware that rapid snow melt can cause the seed to be washed off the pasture. Frost seeding can also be done in December once growth has stopped for the year and before snowfall. This timing works well in areas that receive good snow cover and do not experience prolonged winter thaws. Frost seeding does not work on sandy soils where there is no swelling and shrinking associated with the freeze-thaw cycle. Frost seeding is often done with seeders mounted on ATVs, or a tractor-mounted or handheld broadcast seeder (see Figure 1). When frost seeding with a broadcast seeder, make sure to first determine the effective seeding width to avoid possible overlap of seed. Although not always necessary, cattle (through tromping) or disking can improve soil-to-seed contact. A no-till drill can also be used but this will increase the number of trips across the field. Figure 1. Frost seeding clover with handheld broadcast seeder. Photo credit: Jon Zirkle, Michigan State University Extension. Frost seeding works best with legumes and grasses that germinate fast and at cool temperatures. Recommended species and seeding rates are shown in Table 1. Red and white clovers are the most effective for establishment (Callan, 2010). Birdsfoot trefoil is less successful due to slow establishment. Alfalfa does not frost seed well because its germination is variable at cool temperatures. There are several benefits to adding legumes to pastures including higher quality forage as well as nitrogen to support grass growth. Although legumes are the most successful for this system, some grasses can also be successfully frost seeded. Of the grasses, perennial ryegrass and orchardgrass frost seed with the greatest success (Morrison, 2009); bromegrass has intermediate success; reed canary and timothy have the least success. Typically, ryegrasses will not overwinter in most northern areas, but can be overwintered in other regions; therefore, on these farms, ryegrasses should be seeded with the intent of meeting single season forage needs. Ryegrass and orchardgrass will contribute to forage yields in the seeding year while bromegrass will need a full season before plants become productive. Since grass seed is light, it will not throw as far as heavier legume seeds when broadcast. If seeded as a mixture, this difference in seed weight will result in alternating strips of grass and legume plants. Therefore, seeding the species separately will result in a more even distribution of grasses and legumes. To spread the establishment cost risk of frost seeding, it is generally better to seed at lower rates and repeat in successive years than to seed at higher rates in any one year. Many farmers frost seed 25% of their acreage each year so that they are spreading their risk over different years. Note: Timothy and Reed Canarygrass are not recommended. Reducing competition from the existing stand will help the new seedlings establish. To begin, fall grazing or mowing down to a 2-inch height will slow regrowth of the existing stand in the spring. After seeding, grazing or mowing the field when it is 6 to 8 inches tall will allow for better light penetration to the new seedlings. However, take care to avoid overgrazing which can result in young seedlings being consumed before adequate establishment. Frost seeding can be an effective and inexpensive method to improve the quality and quantity of forage. The key steps to success include good seed-to-soil contact, early seeding at the appropriate time for your climate, proper species selection, and reducing competition. Periodic frost seeding will help maintain high quality forages. Callan, P. 2010. Frost seeding to improve pasture quality. Virginia Cooperative Extension bulletin, Culpeper County, VA. Available at: http://pubs.ext.vt.edu/news/dairy/2011/01-01/dp_2011-01-01_1.html (verified 11 June 2012). Morrison, J. 2009. Hay and pasture. University of Illinois Extension & Outreach Illinois Agronomy Handbook Chapter 6. Crop Sciences Department, Urbana, IL. Available at: http://extension.cropsci.illinois.edu/handbook/pdfs/chapter06.pdf (verified 11 June 2012). Undersander, D. 2006. Frost seeding of forages. University of Wisconsin Extension bulletin. Madison, WI. Available at: http://www.uwex.edu/ces/forage/pubs/frostsd.htm (verified 11 June 2012). Rankin, M. 2011. Frost seeding forages into established pastures. University of Minnesota Extension bulletin. .Available at http://www.extension.umn.edu/agriculture/horse/docs/frost_seeding.pdf (verified 11 March 2014). Undersander, D.J., M.D. Casler, and D.C. West. 2001. Frost seeding into aging alfalfa stands: sward dynamics and pasture productivity. Agronomy Journal. 93(3): 609-619.